Seeds are easy to start indoors. Many vegetable, herb and flower varieties have unique requirements so the key to success is to do a little research on your seeds before you start. Starting seeds is a very rewarding and economical activity and even trying to germinate some of the more challenging seeds can be done if you read the Stokes Seed package to find out which techniques should be used. When your seed packets arrive, skim through all of the instructions given. Most seeds are easy to start indoors but if the amount of information seems intimidating, write out or highlight the sections that apply to you. Most annual and vegetable seeds do not require special treatment to achieve good germination. Make sure you check the recommended sowing dates on the packages. Some seed takes a lot longer to germinate than others. If sowing times seem wide, remember that many factors will affect the growth of the plants and desired planting dates will vary based on your area. To get a more exact sowing date, first find your frost-free date, which is the approximate date of your area's last spring frost. Then back up the number of weeks required to grow the transplants to get the sowing date. Different seeds have various needs in order to germinate. Your seed package will tell you if the variety needs light (press seed on top of the soil) or darkness (generally plant to the depth of the seed size) for optimum germination. While most seeds germinate easily, there are a number of varieties that are more difficult to germinate. These seeds will often have poor or even no germination unless a strict regimen is followed. Very small seeds such as fibrous begonia and petunia are often available pelleted. This process coats each seed to make them easier to handle and germinate faster. The extra cost is definitely worth it. Small seed that is not pelleted needs to be carefully tapped from the packet and gently pressed into the soil. Seeds with a hard seed coat need to be scarified to achieve good germination. This is done in 2 different ways. Smaller seed can be soaked in water 24 hours before sowing to soften the seed coat to allow for germination. Larger seeds need their coating gently abraded without harming the interior parts. This is known as scarification. While in natural conditions this coat would eventually be broken down, the impatient gardener can speed the process by using a knife or file to make a shallow cut. This allows moisture to enter and the seed to germinate. There are some varieties, particularly perennials that need to be put into the refrigerator prior to sowing to break dormancy. This process is called stratification whereby the seeds are tricked into thinking they are experiencing winter. It isn't really necessary for the seed to spend the cold months in the ground, as long as it thinks it did. This can easily be done by placing the seeds in a small container with moist (not wet) sand, peat or vermiculite, and leaving in a refrigerator for four to six weeks. Not all plants can be started indoors; some don't like to be transplanted at all and their seeds must be sown directly into the garden. Again, check your seed packet for instructions. As well, planting instructions for all varieties can be found on the Stokes website - www.stokeseeds.com. You can use just about any container to start seeds as long as it is at least 3" deep to allow for roots to grow. Yogurt cups, plastic take-out containers and margarine tubs are great choices. As well, save any cell packs and trays you get from the nursery. All containers should have holes in the bottom for drainage. Plant containers for seedlings need to be very clean to avoid disease and it is wise to disinfect all containers with a mild bleach solution. 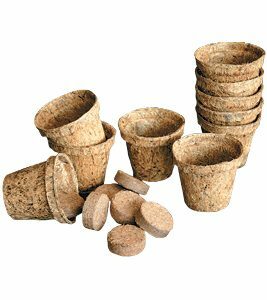 For simplicity, you can use peat pellets, which are a growing container and planting medium in one (Jiffy Peat Pellets). When soaked in water, the pellets grow to seven times their size. These pellets can be planted directly in the garden when the seedlings are ready. It is best not to use the soil from your garden. Not only is it too heavy and provides poor drainage, you run the risk of bringing in weeds and garden soil will host some disease organisms detrimental to your seedlings. There was a time when gardeners sterilized their garden soil in the oven to use for their seeding, but that is a very tedious and smelly chore. It is best to use a commercially prepared ‘soil-less mix’, which can be found at garden centers, home improvement stores or on-line. 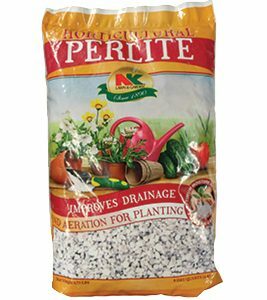 These mixes usually contain peat moss (which is naturally sterile), vermiculite and perlite. All three of these mix components are light in texture and retain large quantities of moisture while still being well drained. Most importantly ‘soil-less mix’ is a clean and sterile environment that will help keep your small seedlings healthy. The general rule for seed starting is start seeds warm but grow seedlings cool. Don't try to germinate your seeds on the windowsill. The outdoor temperatures will make this area too cool. Most seeds are genetically programmed to germinate only in warm soil. Check the seed package for the optimum soil temperature. You can keep the seed trays consistently warm by placing them on top of a water heater or refrigerator. Fluorescent lighting or heat lamps also can keep the soil warm. 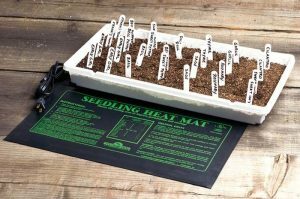 If your area is quite cool, a seedling heat mat may be your best option. Commercial greenhouses use both lights and hot water heating systems to keep seed trays warm. Seeds need to be constantly moist in order to germinate. Do not let the growing mixture dry out or equally as important get too wet. 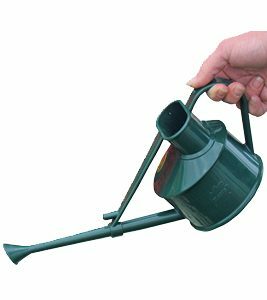 Moisten the growing mix thoroughly before sowing. Stir the mixture with your hands to distribute the moisture. After the seeds are sown, place a humidity dome or plastic wrap over your container to slow evaporation. Check every day for signs of germination and remove the cover as soon as you see a sprout so that the air can circulate around the emerging seedlings. Water with a fine spray of warm water or from the bottom. Avoid watering with icy cold water. Lack of light is probably the number one reason people get discouraged as seedlings grown in weak light will stretch, will have weak stems and often a pale color. Seedlings need 14 - 16 hours of light from the moment they germinate. They also need at least 8 hours of darkness to process their food and grow. 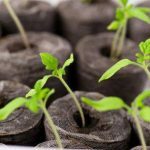 Growing seedlings on a windowsill is not recommended, as they will stretch toward the light and most windowsills have low levels of light. If the windowsill is your only option, turn the containers daily so they don't have to stretch and reach for the light. You will know if your seedlings need more light if they are pale and weak. 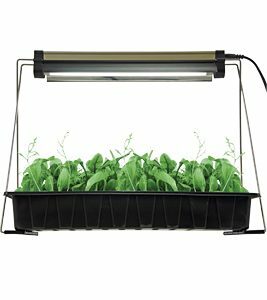 Fluorescent lighting or grow lights are your best option. Even if you don't have a store-bought stand, one can be made with a cast-off fixture, some cedar or treated lumber, screws, nails and cords. The best growth will occur under the maximum light you can provide. Mix the types of bulbs used since the cool white provides light in the blue/green range and encourages leaf growth, while a grow light or warm light provides light in the red range, which encourages flowering. This way you have a full spectrum of light. Replace the bulbs yearly, as the light intensity decreases significantly even in the first few months of use. Keeping bulbs longer doesn't save money compared to the poorer growth of the plants. Get your plants as close to the light as possible by putting the lights on adjustable chains keeping them 2 - 4 inches above the tops of seedlings. Move the light fixtures up as the seedlings grow. Incandescent or LED grow lights also work well but can be more expensive overall than fluorescent. Adding artificial light can also help keep seedlings warm. The new seedlings need additional space to grow as soon as their first "true" leaves appear. It may seem heartless, but the weakest and spindliest seedlings need to be cut off at soil level so that the strongest ones can get stronger. If your seeding is rather dense, do not pull out unwanted seedlings as their roots may be tangled up and damage the root of the seedling remaining. At this point it is a good idea to place a fan on your plants. This will make their stems sturdier and get them ready for outdoors. As well, good air circulation will keep moulds and mildews at bay. If you did your planting in individual containers, transplanting is not necessary before you set them outside. Seedlings in seed flats need to be transplanted into 4" containers by the time you have 4 true leaves. This will give your seedlings more room to grow, stimulate the feeder roots and improve ventilaton. To transplant, hold the seedling by its' leaves, not the delicate stem. With a butter knife, spoon or fork, gently cut around the seedling root and lift up. Place into a pre-moistened container, slightly deeper than they were in their flats. Firm soil around the seedlings, water immediately. 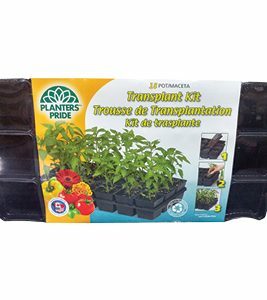 After transplanting, fertilize once a week with transplant fertilizer or a half-strength well balanced fertilizer. After about 3 weeks you can start fertilizing at full strength. Over-fertilization can result in leggy seedlings. If your seedlings are starting to look leggy, pinch back the growing tips to promote more branching. This can be repeated every week or so to promote compact, bushy plants. Hardening off is basically getting your small plants ready to face the great outdoors. There are many different ways this can be accomplished. At least a week before you plan to set the plants into the ground they need to gradually get used to the sun, wind and various outdoor temperatures. A cold frame, which is a sheltered unheated box with a translucent cover is the best means for this transitional period. The lid can be gradually raised to expose the plants to more sunlight. If you don't have a cold frame, you can also use row covers (Stokes carries various sizes, which will help protect the plants). You can also place your plants in a shaded, sheltered part of your garden for a few hours each day, gradually moving them into more sun. These unprotected plants will have to be brought back indoors each night unless you know it is going to stay above 50°F/10°C all night long. If you have followed the directions above, your seed starting should be relatively trouble free. There are however, a couple of problems that may creep up on you. INSECTS: spray insecticidal soap on spider mites, aphids or whiteflies as soon as they appear. DISEASE: Using clean containers and soil-less mixtures should keep diseases at bay. A common disease is Damping off, which is a fungus that attacks the plant at the soil line. One minute your seedlings look healthy, and then suddenly they topple over. Making sure the seedlings have good air circulation (a fan will help) as well as making sure you don't over-water, will also help prevent this.